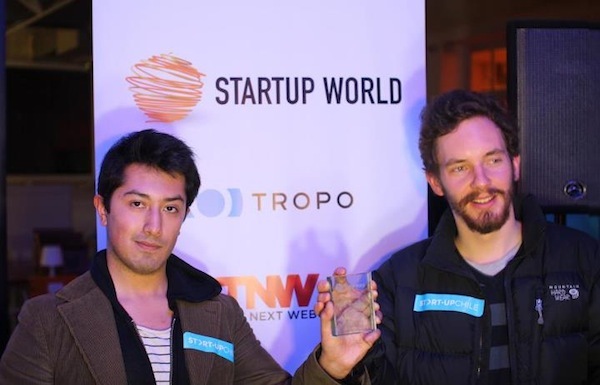 The hunt for the next Mark Zuckerberg continued in Chile on Monday as eight finalists battled it out to compete in Startup World – The Next Web’s startup competition to promote entrepreneurship and startup culture globally. The judges deliberated and scores counted with Edoome crowned winner with the highest score, beating off stiff competition from the other startups. The Chilean founders of Edoome – an educational social network that seeks to facilitate the management of the classroom and also connect students and teachers to let them communicate, collaborate and share their content and knowledge – Leonardo de la Fuente and Francisco Rubio said they were pleased with the result and excited to travel to Silicon Valley for the grand final in 2012. You can follow the company on Twitter here. An impressive lineup of judges challenged the finalists on revenue models to pitch pitfalls; Horacio Melo, Executive Director of Startup Chile, Catalina Boetsch, Assistant Manager at Corfo and Paolo Privitera, CEO & Founder of Pick1 gave feedback to all startups who competed in the event. Over 250 startups applied for South America, the ten startups that were chosen as regional finalists for Santiago, Chile were Voz, Edoome, Bractlet, Student Loan Hero, Imaginate Software Labs, Socialmeter.tv, Nixter, Escapes With You, Ombú Shop. The Startup World team would like to thank our on the ground partners Startup Chile, Movistar Innova and Alan Richardson for arranging a trip into the mountains with Localguiding and our beer sponsor Kross and Carolina Rossi for all her hard work in helping us organize the event.